Whether in a new build or renovation in Tampa, FL, the inclusion of a drain field installation is mandatory for properties with septic systems. When deciding whether to perform a drain field installation on a property in Tampa, FL with a septic tank, the government has already made the decision for you – it’s a requirement. Every time customers and employees use the toilet, run the faucet, or do a load of laundry, a portion of the water and waste go into the septic tank, while a lot of the water seeps into the drain field – a necessary operation. Commercial drain field installation is an important cog in the septic system to help remove the contaminants from the liquid in a septic system. The ‘septic system’ in fact consists of the septic tank, the drain field, and all the piping associated with the travel from the home. We specialize in new drain field installation for your Tampa, FL commercial property. Typically a drain field consists of trenches with perforated pipes and a material (usually gravel) that is used to filter the water. The gravel is topped with soil to prevent animals or other exposure, and the system functions largely sight unseen. Whether you are looking for a drain field installation for new building construction in Tampa, FL or a replacement for a system that has gone wrong, we are your experts in the field. At Southern Water and Soil, we not only lay out the drain field in the most convenient location to not affect surrounding businesses, but we also perform the percolation tests, permit applications, and other requirements to ensure the system conforms to all local Tampa, FL commercial regulations. 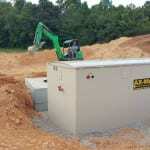 We are your one-stop partner in the field for all things related to commercial drain field and septic installation. At Southern Water and Soil, we offer drain field installation services in Tampa, Odessa, Lutz, Land O’ Lakes, Brandon, Orlando, Plant City, Dade City, Bartow, Lake Wales, and Lakeland, Florida.